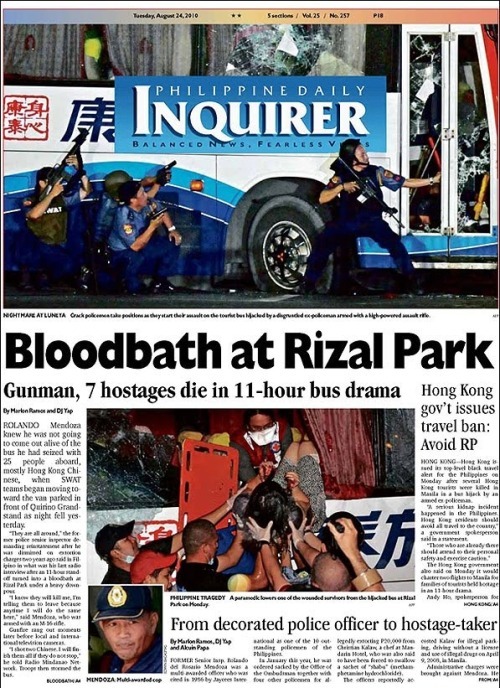 Exactly two years ago, on the day after the bloodbath at the Quirino Grandstand, this was the headline of The Philippine Daily Inquirer. Yesterday marked the second year of the infamous Manila Hostage Tragedy where 8 Hong Kong tourists died when dismissed police officer Senior Inspector Rolando Mendoza hijacked a tourist bus carrying 25 people in an attempt to get his job back. Yesterday’s commemoration may have been overshadowed by other issues and events (Sen. Tito Sotto’s alleged plagiarism and his staff’s moronic defense and the sudden death of DILG Secretary Jesse Robredo, to name some) but this tragic event in our history is still fresh in my mind, as if it happened just recently. I was then in between doing my editing works and procrastinating on Tumblr when the news broke out the morning of August 23, 2010. Having seen a similar situation years before when Jun Ducat held hostage preschool students in a bus, I told myself that this will also come to a peaceful end. I even exchanged some good laughs and ideas with an online buddy, Tita Marj, about the possibility of creating a biopic for Captain Mendoza and guessing who would be the best actor to portray him (I personally chose Efren Reyes Jr. and Spanky Manikan for the role). The whole afternoon and early evening went by with me tweeting and posting some stuff on Tumblr about the hostage crisis, my opinion, my rant against Captain Mendoza, on how would it affect our image to the international community, and being glued on the evening news on television, monitoring the events. And then the unexpected came. The whole country – and perhaps the whole world – was in shock. It has been repeatedly said that no one wanted this to happen. Our country has repeatedly apologized to the victims. But is an apology enough? No. Is justice served to the victims? Apparently, even after two years, not yet. I understand the grief of the victims’ kin. Two years after the event, only one among those who were recommended to be accountable was punished and sacked from office (the alleged extortionist ex-Deputy Ombudsman Emilio Gonzalez III who is one of the causes of captain Mendoza’s outrage). I personally read the recommendation of the Incident Investigation and Review Committee (IIRC) soon after the document was made public and I was disappointed to learn that some of their recommendations were not followed by the Palace. For instance, they did not follow the recommendation of the IIRC to sanction PNP Chief director General Jesus Versoza, Manila City Vice Mayor Isko Salvador, and DILG Undersecretary Rico Puno (the latter, allegedly, was saved because he was the President’s shooting buddy). But to be fair, I commend the current administration in their efforts in their drive against corruption. We do not want to make another Captain Mendoza among the civilians and our servicemen. It will be remembered that one of the reasons why Captain Mendoza hijacked the bus was the alleged corruption (and bribery for his pending case) on the Office of the Ombudsman. Two years have passed and although justice is yet to be fully served on the victims, we can see some changes on the system. There’s already a new Ombudsman in the person of Conchita Carpio-Morales. With the sudden death of Sec. Jesse Robredo, the clamor of the public for a clean and honest governance has increased. With the appointment of the new Chief Justice, Maria Lourdes Sereno, hopefully, there is a drastic change in our judiciary. And with the active participation of the people through social media, I think, we are getting closer to the dream of having a clean system. But before all of these good things to materialize, let us not forget that there are grieving relatives of the victims, there are accountable persons who are yet to be sanctioned, and there is still an elusive justice that is yet to be served. And I hope this would never happen again. Never again. Manila Hostage Tragedy Survivors call for an Apology from Philippine Government– Two years after the tragedy, the cry of the victims’ families remains the same. Who were Accountable for the Manila hostage Crisis? During the commemoration of the first anniversary of the tragedy, GMA News Online looks back at the personalities held liable for the tragedy and examines if justice has indeed been served to the eight victims of dismissed policeman Rolando Mendoza, who was himself killed in a police assault viewed live worldwide. This day marks the 33rd month, the 1,004th day of the infamous Ampatuan Massacre, a horrible event in our history where 58 people were killed, 34 of whom were journalists or working for the broadcast industry. Justice is yet to be served, but do you still care? It seems like the attention of the public on this issue is slowly going to the depths of the abyss of the forgotten. It’s in one of the infamous characteristics of the Filipinos. We have a short attention span. We tend to forget our past easily. Mabilis makalimot. Mabilis magpatawad. Or it is being overshadowed by other news and events. As of writing, the nation is in grief with the sudden demise of a great man, a great leader, and a great family man, DILG Secretary Jesse Robredo (together with two pilots Jessup Bahinting and Kshitz Chand). He was known to be one of, if not the best Secretary the DILG has ever had. His programs and reforms, most notably the Seal of Good Housekeeping, kept the municipalities and cities striving to perform better. Or perhaps we no longer care about the issue anymore? As I write this piece, the local Twitter trending topics are filled with obscure statements of support for these pseudo-reality love teams and famewhores. I have always believed that the trending topics on Twitter in a particular country reflects its people’s priority, interest, and views. It’s a tragedy that these fantards behind the so-called ‘jeje trends’ on Twitter seem to be more influential than the people behind the voices of reform, vital information, advocacy, and policy making. What a shame! By letting this event just pass us by our consciousness, it would appear that we are condoning the perpetrators of this crime. Or depriving justice to the victims and their families. Or killing the fifty-eight victims repeatedly. The victims’ death will not be given justice if the perpetrators of the crime are not prosecuted and punished. A great man’s death would be in vain if his good works, programs, and legacy are not carried forward. The victims of this gruesome massacre died doing what is right – the victims, in the sense of a change of leadership by means of a lawful and honest election and the mediamen, by telling their (victims’) story and by acting as our eyes, ears, and mouthpiece of that event. Personally, I think Sec. Jesse Robredo gave as an example of what it takes to be a leader – that you can lead and uplift people’s way of lives without the use of violence and intimidation; that you can be a great and beloved leader despite of the the notion of the general public in politics as dirty; that you can lead a city for a long time and still be loved and trusted by the people; and that you can be a leader in its truest essence – a servant-leader. This massacre is caused by the warlord’s struggle to keep their power and to protect their self-interest against any possible threats. Bad politics, bad leadership, and people continuously feeding these beasts by means of the culture of tolerance, impunity, and patronage politics. But we have seen that it is not impossible to have a good, efficient, and selfless leader to rule among us. And we don’t want it that way, right? So what can we do as an ordinary citizen? Never forget. Let us always put the Ampatuan massacre into consciousness. One way of doing it is to post something about it every 23rd of the month for everyone to see (on Facebook, Twitter, and in your blogs). This will help those who have forgotten to remember. Be an educated and wise voter. The Ampatuan massacre is an election-related violence which involves (an alleged) private army. Choose your leaders wisely. Do not be swayed by their goods during the campaign season. Be vigilant. Stay on guard, be watchful. Let us be our brother’s keeper. And let us keep an eye on the proceedings of the trial (even if it takes 55,000 years, according to Atty. Harry Roque). It is painful to admit that the wheels of justice in our country are not well-oiled, causing it to roll slowly. And it is more heart-wrenching to know that the witnesses of this massacre are either being killed one-by-one or being abducted never to be seen again. But let us not give up, let us not lose hope. As cliche as it may sound, the only way for evil people to triumph – or the culture of impunity to prevail in this country – is for good and responsible people to do nothing. Let us chase Lady Justice no matter how exhausting, no matter how it seems to be hopeless, and no matter how long it takes. Justice for the Victims of the Ampatuan Massacre. Never Forget. Never again. 1,000 Days without Justice – Interakaksyon.com’s comprehensive page about the Ampatuan Massacre, the continuing battle of the bereaved family members, and the continuing search for justice. Photo courtesy of Philstar.com’s editorial cartoon.